Tesla is the first to put 1,000 electric cars on the U.S. highways. Like its Roadster, the company is going zero to sixty in less than four seconds. The Tesla Roadster has a rated range of 236 miles on a single charge. In Australia, a record 313 mile range was demonstrated. The Tesla Roadster has a battery pack capable of storing approximately 53 kilowatt-hours of usable energy, almost double the energy of any other commercially available electric vehicle battery pack. Tesla will compete with other sedan makers by also offering more passenger space, more cargo space, and a premium cache. With seating for five adults and two children, plus an additional trunk under the hood, Model S has passenger carrying capacity and versatility rivaling SUVs and minivans. Rear seats fold flat, and the hatch gives way to a roomy opening, so you can stow a mountain bike, 50-inch flat-screen TV. The Model S includes a 17 inch infotainment touchscreen. With a range up to 300 miles and 45-minute QuickCharge, the Model S can carry five adults and two children in quiet comfort. The roomy electric car starts at a base price of $57,400, before the $7,500 federal EV tax credit and additional tax credits in many states. Yes, it will be more expensive than sedans from Ford, Nissan, and Chevy but with more battery storage for more range with 3 battery pack options offer a range of 160, 230 or 300 miles per charge. Don’t pull-up to the Model S in your sedan and try to race. The Model S goes from 0-60 mph in 5.6 seconds with 120 mph top speed, and the promise of sporty handling in the chassis and suspension. Tesla touts its expertise and intellectual property in a proprietary electric powertrain that incorporates four key components—an advanced battery pack, power electronics module, high-efficiency motor and extensive control software. Tesla delivers more range per charge than other electric vehicles by including more lithium batteries. Tesla’s relationship with battery supplier Panasonic is critical. 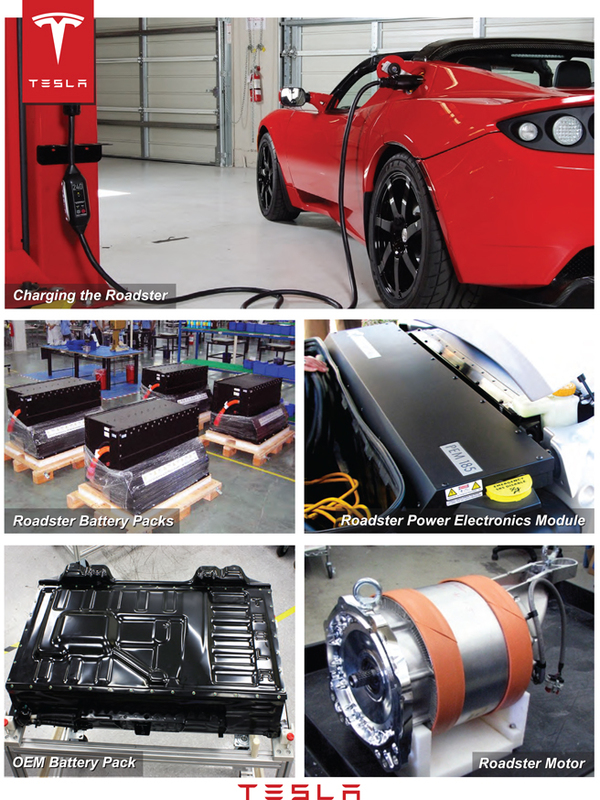 The Roadster uses 6,800 Panasonic lithium-nickel consumer-sized batteries integrated into a Tesla designed battery-pack with unique energy management and thermal management. The new Tesla Model S will use up to 5,500 Panasonic batteries. Benefiting from Tesla feedback, Panasonic is improving the batteries with plans to take them to 4 amp-hours. Panasonic is the world’s largest seller of lithium batteries. It acquired Sanyo Electric to increase market share, expand into solar PV, and battery R&D innovation. Panasonic also makes flat-panel screens and automotive electronics. When Panasonic acquired Sanyo, Toyota increased its ownership to over 80 percent in the Panasonic EV Energy Company which makes prismatic module nickel metal hydride and lithium-ion battery packs. Tesla Motors has purchased the former NUMMI factory in Fremont, California, that once employed over 4,000 workers in a Toyota-General Motors JV plant. The factory is an important component in Tesla’s access to a $465 million in DOE loan facility, where funds can be issued in stages over 3 years as conditions are met. In the future, Tesla will build the Model S sedan and future Tesla vehicles in Fremont. It is one of the largest, most advanced and cleanest automotive production plants in the world. Tesla’s move represents the chance for California to recover needed employment. The plant is capable of producing half a million vehicles per year or approximately 1 percent of total worldwide car production. The factory is located near Northern California’s Silicon Valley, very near Tesla’s Palo Alto headquarters. The short distance also ensures a tight feedback loop between engineering, manufacturing and other divisions within the company. Toyota agreed to purchase $50 million of Tesla’s common stock subsequent to the closing of Tesla’s currently planned initial public offering, giving Toyota over 2 percent of Tesla. Tesla and Toyota intend to cooperate on the development of electric vehicles, parts, and production system and engineering support. Nissan, Ford, and GM would all like to leapfrog Toyota for plug-in car leadership after years of watching Toyota dominate the hybrid market. Toyota, however, will fight to protect its leadership with a Prius Plug-in Hybrid, the Toyota FT-EV electric car, expanded offerings of Toyota and Lexus hybrid cars, the Panasonic battery JV, and now a partnership with Tesla. “I’ve felt an infinite possibility about Tesla’s technology and its dedication to monozukuri (Toyota’s approach to manufacturing),” said TMC President Akio Toyoda. “Through this partnership, by working together with a venture business such as Tesla, Toyota would like to learn from the challenging spirit, quick decision-making, and flexibility that Tesla has. Decades ago, Toyota was also born as a venture business. By partnering with Tesla, my hope is that all Toyota employees will recall that ‘venture business spirit,’ and take on the challenges of the future.” President Toyoda likes to race cars and has driven the Roadster. Toyota introduced the first-generation Prius hybrid vehicle in 1997, and produced approximately 2.5 million hybrids in the twelve years since. Late last year, TMC started lease of Prius Plug-in Hybrids, which can be charged using an external power source such as a household electric outlet. The company also plans to introduce EVs into the market by 2012. Tesla has been skillful in developing strategic partnerships. Tesla also has a relationship with Daimler to supply technology, battery packs and chargers for Daimler’s Smart fortwo electric drive. Daimler holds more than 5% of Tesla’s capital stock. Daimler has orders for Tesla to supply it with up to 1,500 battery packs and chargers to support a trial of the Smart fortwo electric drive in at least five European cities. Tesla delivered the first of these battery packs and chargers in November 2009. Daimler also engaged Tesla to assist with the development and production of a battery pack and charger for a pilot fleet of its A-Class electric vehicles to be introduced in Europe during 2011. Tesla has ambitions to supply other vehicle makers.